AVMA Change Attitude Towards Declawing? We know that the American Veterinary Medical Association (AVMA) have changed the wording of their position statement with respect to the declawing of wild and exotic cats for non-medical reasons. Is this indicative of a general shift in their stance on declawing? Does it presage a change in their position regarding declawing of domestic cats? This is a discussion page. I would like to analysis that statement briefly. The executive board changed the wording from “opposes” to “condemns”. This shows stronger feelings by the executive board against declawing wild cats and exotic cats. 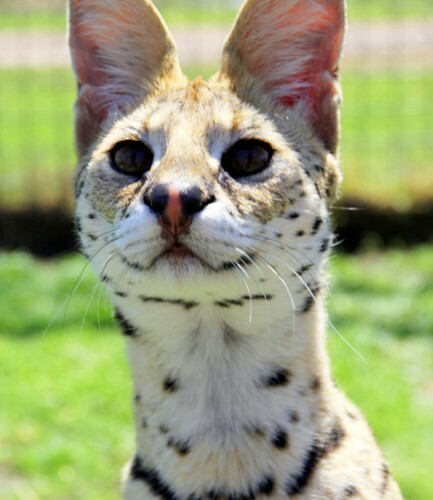 Serena is a declawed serval who was living as a domestic cat. How does the AVMA statement relate to her? Photo by Michael Broad. Other than for medical reasons that would clearly benefit the animal, there appears to be no justification for performing the procedure in this population of cats. “This population of cats..” refers to wild cats and exotic cats. We know what wild cats are but there is no absolute definition of “exotic cat”. For me and many people, “exotic cat” refers to wild cat hybrids and these are domestic cats. However, we should not get excited because I don’t think the AVMA want to include wild cat hybrid domestic cats in this statement. This is just a minor point but I think the wording could be improved. So, what is the difference between wild cats in captivity and domestic cats? Why have the AVMA differentiated between wild cats and domestic cats in respect of their attitude to declawing? Isn’t this a form of unnecessary discrimination? What justification is there for this artificial discrimination? To train or adapt (an animal or plant) to live in a human environment and be of use to humans. In the United States, servals are often domesticated and live in homes. Servals are medium sized wild cats. Cougars are also domesticated and even tigers etc.. These cats are often declawed. How does their position statement square up with the huge number of domesticated wild cats? As the declawing of domesticated servals continues to take place and the operation is carried out by AVMA registered vets are the AVMA going to punish these vets? NO, of course not. They can’t as far as I am aware. The AVMA has a publicity function as I understand it. They appear to have no teeth and set no enforceable standards. The oath is meaningless because every day tens of thousands of vets are in flagrant breach of it when they declaw a cat. The point I am making is that there is very little difference between captive, domesticated wild cats that live in homes or enclosures attached to homes and “domestic cats” yet the AVMA condemns the declawing of these cats but not domestic cats. The AVMA position statement appears to be discriminatory hot air, words not action. Yet even that miniscule change of position gives us, people who hate declawing, hope of real change. Perhaps the mew wording is a very small signal that the AVMA is recognising that declawing cats, domestic or wild, is immoral and, in fact, damages their profession. I argue that it would be an excellent business decision to condemn declawing across the board and then for the vets to stop doing it. They’d make more money in the long run because they would be better respected in the community for genuinely being concerned about animal welfare. This entry was posted in Declawing, Veterinarians and tagged AVMA, captive wild cats, declawing cats, veterinarians by Michael Broad. Bookmark the permalink. It’s gotta be greed. As a vet, even though things may be tough you can still make some pretty decent money compared to others and even if you lose some if you don’t declaw surely the moral question makes that an easy choice to make. I honestly think that some of them don’t think its bad and they simply don’t have feelings or compassion for animals. Why the f**k did they become vets then? Why oh why do people who don’t care about animals end up working with them and having enormous power over them? What goes wrong. When do they start thinking it doesn’t matter and the cat will be fine so just do it… It’s a tragedy. Furthermore if the rest of the world except Canada can make such a thing illegal and considered as abuse what the hell do they think they are doing in the face of all that except behaving like total a**h*les who should be ashamed of themselves. Its all based of the simple fact that so far the average north american has no idea that it’s evil so the vets use the fact. Probably people over here don’t know about it either but I guess our government and vets, in this instance, are more trustworthy. If in the US the vets and goevernment allow such a thing to carry one then what else are they doing? I’d be worried. It just shows a low standard of animal welfare. I know that genetic engineering and all that is still allowed over there and that concerns human beings. How can you trust your government to have your best interests in mind when they continue to allow you to be fed awful low quality and dangerous food when in the rest of the developed world its is illegal. Again, based on not informing the public I suppose. It’s a scandal for both humans and animals alike. I have little hope. Living in Canada that was something that truly frightened me. The fact that alot of the fruit and veg out there is produced with pure profit in mind to the point of it being unhealthy and the government does nothing to defend you and prevent it. I’d stick to certified organic out there if I didn’t know for sure about the other stuff. You have to also appreciate that the US has it’s own ideas and kind of doesn’t care what anybody else thinks. It’s gonna do what its’ gonna do and for as long as the general populous doesnt know much about anything then those in power can keep raking the dollars. I’m not saying it isn’t like that everywhere else in some way but here in Switzerland even the cheapest food has standards and they are advertised clearly on the box. Its a bit less cheap actually. But animal welfare here is much better. The cheapest eggs don’t come from chickens who live in boxes and eat their own poop. I for one feel pretty much like I can count on the government here making sure nothing too awful is happening when it comes to stuff I am not informed about. You can’t know about everything. But in Canada I did not feel like that at all. It felt entirely corrupted the whole system of capitalist democracy over there. You kind of feel like they would let you eat your own poop if they could save a buck out there and so when it cpomes to animals it shudder to think what goes on. Here animal welfare is good. I will admit Switzerland does have one a**h*le of a company Nestle who intact own a bunch of pet food brands. However as much as I wouldn’t trust them on the end of a barge pole I know that they can’t get away with stuff here because the government just won’t let them. I bet they lower the standards wherever they can though. The whole issue of declawing in North America is scandalous and internationally antisocial and its just another thing that would and should make it’s own people extremely angry and untrustful of it’s own authorities. I bet there are other similar scandals in other proffessions and moral issues that are just the same over there. It’s the new kind of corruption is what it is. I prefer the system in Russia where you just pay your baksheesh and nobody is pretending it isn’t so nobody is ignorant. Better than making everything look pretty for as long as it is physically possible to not let people know what is really happening. At least for a while now some Vet techs have been speaking out and telling the truth about the horror of declawing. They are the ones who have to assist at the cruel surgery and to clean up the blood and care for their patients while they are suffering from pain and shock. Some have been fired for telling of this and some for warning clients about the consequences of declawing. Some of course are just like the declawing vets and don’t care that they make blood money for their wages. I don’t know how anyone can ever consider that the amputation of cats toe ends is acceptable. Money seems to be the most important thing in the world nowadays to far too many people. People think that no one acting in a professional capacity, especially in a helping profession, would do anything to harm their clients. Oh, there are certainly some individuals who are incompetent or dishonest, but there couldn’t be widespread actions by a professional group that are harmful to clients. Many who are against declawing say that it’s fine so long as you have a good vet. Some vets are butchers and botch the job, but if there was anything inherently wrong with declawing the AVMA would condemn it in every instance. The veterinary profession wouldn’t allow it at all if it was harmful. The problem is that the above, though believed by most people, is untrue. Professions can be corrupted. School teachers come to care more about protecting their pay and benefits than about children and illegally go on strike– compromising the education of the children placed in their care. Some teachers deplore these tactics, but they are widespread. Can’t we trust teachers to put their students first? Not always. I left one school back in my teaching days because the teachers bad mouthed students in the faculty lounge all the time. It was unprofessional and unethical behavior, so widespread in that school that I could no longer work there. Physical therapists, occupational therapists, speech therapists– all these professions are filled with individuals who routinely commit Medicare fraud. Companies require very high productivity standards– require therapists to bill for more therapy than is really needed. This doesn’t benefit patients and it bilks taxpayers out of millions of dollars every year. As a physical therapist assistant working for a staffing agency, I’m losing a lot of money by refusing to work for companies with unethical billing practices. But I have to do what’s right.Recent changes to Medicare hurt seniors, I believe, but they were necessary to counter all the fraud. It’s bad enough and widespread enough that sometimes I regret becoming a PTA. Name the profession and I’ll bet you can find ethical problems with it– widespread problems– not just the occasional bad or incompetent person. The only way change happens is from the inside. Sometimes that even means leaving a profession or a job. It’s up to vets and vet techs to confront the atrocity of declawing. In the meantime I have very little respect for the veterinary profession. So long as they defend declawing they will never have the best people entering that field. Anyone with ethics (or a heart) will steer clear. There are a few good vets who fight against declawing, but there aren’t enough of them. I hear you. Sometimes it’s not what they say. Sometimes a part of the message lies in implications, inclusion, or lack of inclusion. Like you and the others, I would have liked to have seen “all cats” or “domestic cats” included in their statement. It is definitely discrimination against domestic cats. I think that any step in the right direction is a good step. As you said, it gives ethical people a bit more hope that somewhere down the road, they’ll condemn it for domestic cats as well. All in all – though not directly an active statement for domestic cats – it’s a good step in the right direction for those who despise declawing. Some day declawing will be outlawed in the USA. It’s inevitable. Now that the powerful AVMA has taken a step in that direction, it may not be long before they make the statement about domestic cats. Once that happens, the legal change should follow suit. My stance is that their statement is a good thing for the most part though I am disappointed that domestic cats were not included in the statement. I agree, Liz, and thanks for the optimism. I don’t see how they can say that yet deny declawing harms pet cats as well,condemn surely means get rid of because it’s no good. A condemned house gets knocked down and removed because it’s dangerous,declawing is dangerous and needs removing from all vets surgery lists. I’ll be writing to the AVMA once again but unlikely to get a reply because they have no scruples and money is the God of them and their declaw vets and that’s sickening. This is a tiny step in the right direction. I think she and the Paw Project vet Jennifer Conrad DVM will be asking the AVMA that question. I think we all need to ask them that question too! What use are they if they allow major unnecessary surgery to be done to countless cats by so many of their members? Declawing vets can’t go on much longer denying the truth, disregarding the physical/mental problems from declawing and the number of declawed cats relinquished to Shelters and killed through no fault of their own. Yes it is damaging their profession Michael because it is all about easy money, yet vets here in our in country where declawing is banned, make a good living and retire early,surely all American vets could do the same! I’m so glad there are people like yourself and organisations who speak on behalf of cats keeping their claws. I’m going to find out more about the anti declaw movement. Meanwhile it seems like a very tiny step in the right direction I suppose. At least they are admitting that there are problems with the process and its not something that can be done with no moral or physical price. Despite my pessimistic approach to the news, I agree that it is a very small step in the right direction. There are over 150 pages on declawing on PoC.